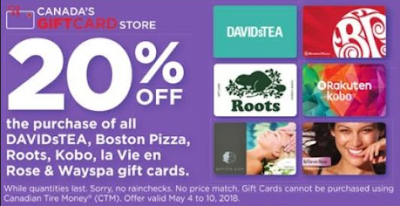 When you purchase of DAVIDsTEA, Boston Pizza, Roots, Kobo, la Vie en Rose and Wayspa gift cards at Canadian Tire stores between May 4 and May 10, 2018, you will get 20% off. Note: No rainchecks. No price match. Cannot be purchased using Canadian Tire Money.